Live out all of your rock and roll dreams and revamp your look into one that resembles a classic rock icon. 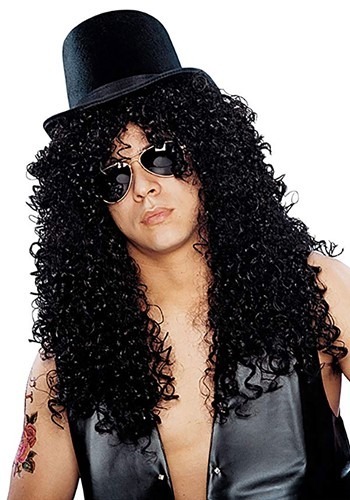 Fulfill your wildest dreams of all night parties, shredding guitar solos, and selling out arenas when you put on our Curly Rocker Wig. Pair this wig with a simple black top hat, a pair of sunglasses, a leather vest and some temporary tattoos if you don't have any real tattoos to show off. You will look as if you just stepped off the stage after entertaining the crowd with a raging guitar solo. Prove you're ready to rock with this curly rocker wig! Wearing your hair styled in long, black curly strands is a sure way to be recruited into a rock band or maybe just a hair band if you don't have that killer guitar solo down yet.